Someone clean this mess up! Every time I watch your show I'm glad that my childhood TV shows were filtered into Anime and re-translated shows (TF Armada were the voice-acting was actually good). On the upside, I don't have that song in my head. On the downside, I do have the theme song in my head. It was the closest thing to good in the show. I have the first episode on VHS because it was a buck and I wanted to remind myself just how bad this was. Then again, I wouldn't call the Troma movies hilarious, either, so I may not be the one to ask. You didn't note that while the movie version is the Toxic Avenger in the show he's called the Toxic Crusader (while the show is called Toxic Crusaders). I guess that as long as they don't see the video box cover kids wouldn't connect the two. Kids should never see those movies. Ever. captain planet was WAY better LOL! I've been watching this on and off on Hulu, and I at least respect the Toxic Crusader for trying. 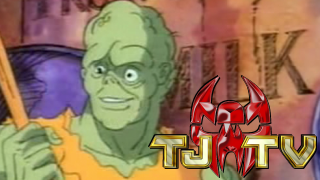 I like that in the end of the first epsiode, Toxie actually asks the obvious question of why on earth a person would make it their goal to pollute, and that the villain actually has a legitimate reason (compared to Captain Planet, at least). And I do like that there is at least some effort to grapple with the extremely formulaic nature of these shows. I actually like the bit where the henchman pinpoints all the cliches before they happen. Yeah, the writing is pretty much never actually funny and this is one of the worst looking cartoons I have ever seen, but at least some thought went into it, I'd argue more then a lot of shows in 1991. THIS IS BAD COMEDY LOL! !